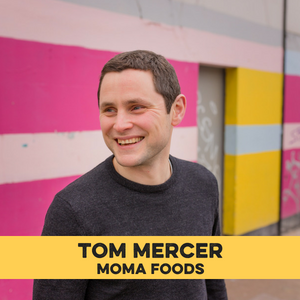 Tom Mercer is the Founder of MOMA Foods, a London based breakfast food brand. Frustrated with the lack of quality breakfast on the market Tom decided to leave his job in the City and do something about it. MOMA was a genuine grass roots start up – the first kitchen was under a railway arch in South London and the first retail outlet was a stall (made from a converted filing cabinet) in Waterloo station. MOMA is now the fastest growing porridge brand in the UK, and the #1 bircher muesli brand, supplying the grocers, travel, and food service sectors, and is pushing into new export markets. MOMA has been a fascinating journey since it started in 2006 – working across chilled and ambient, several project ranges, and 7 manufacturers. Building a strong, authentic, and dynamic brand alongside this has been key. Tom has worked in all areas of the business and his main focus now is looking at innovation within the MOMA brand. Tom is from a farming family in Staffordshire, read Natural Sciences at Cambridge, and prior to MOMA worked as a management consultant for Bain & Co. In his personal life Tom is a proud husband and dad. Tom will be joining our panel on "Branding and telling your story" in the Shoptalk room on Thursday. Get your tickets here.